Recipe first published on January 18th, 2010. Last updated on October 22nd, 2015. Nearly six years ago I wrote this post and since then, it’s been one of my most popular post thanks to people searching for “Landmark Spinach Bisque.” I feel like it’s only right that I’m giving this post new life as I sit in Galesburg, showing Mack my old stomping ground (and visiting nearly all the family). It’s going to be a long shot but if you’re ever traveled through Galesburg, Illinois- you might have stopped at the Landmark. It’s one of the few staple restaurants Galesburg has and if my instagram feed is any indication, a place I go every time I’m home. The food is great and the atmosphere makes you feel like you’re not in some small town in the middle of Illinois. When I first made this bisque, I tried to mimic the bisque from the Landmark but what came out of the recipe was a bisque that was nothing like it but still delicious. If you landed here in hopes of recreating the spinach bisque from the Landmark, there’s some good clues in the comments below to get your started. 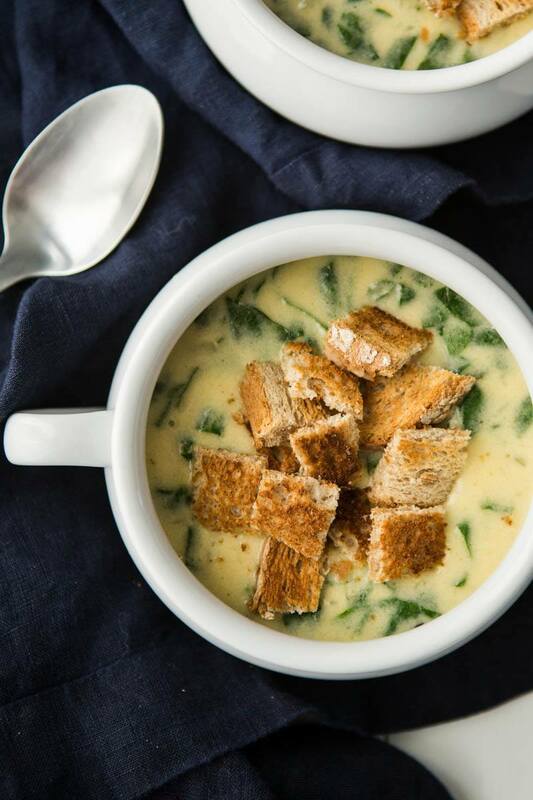 If you’re looking for a creamy/cheesy spinach bisque, this recipe is a good a start. Cheese: I prefer a good sharp cheddar but any quality, good melting cheese will work. I’ve also been known to toss in a bit of fontina, smoked gouda, or mix (with a bit of shredded asiago thrown in as well). Milk: When I first started making this recipe, I used half and half. I’ve since then changed to whole milk but if you’re looking for an extra rich treat, use the half and half- you won’t be disappointed (but it’s rich, that’s my warning). 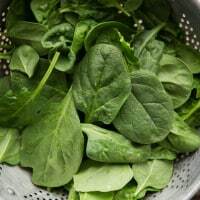 The spinach: I prefer this soup with fresh spinach but in a pinch, you can use frozen. Just make sure to thaw and drain it well before adding it to the soup. 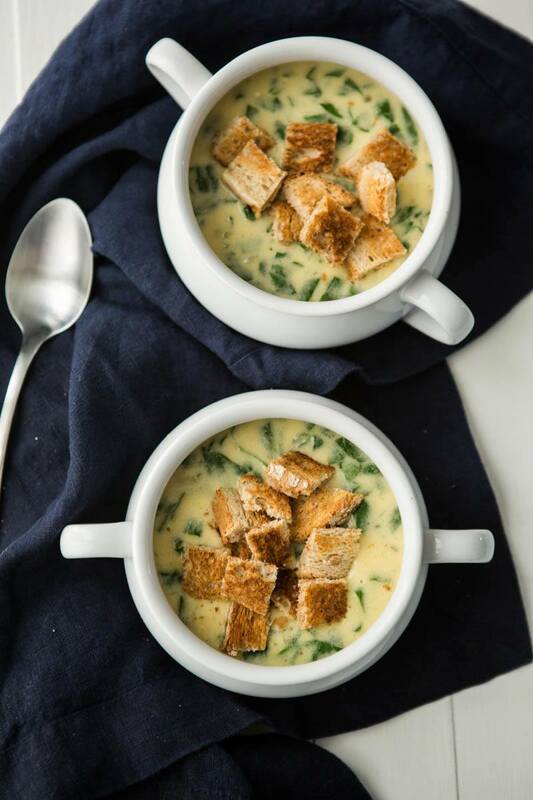 Creamy bisque loaded with cheese and spinach- a delicious, vegan soup perfect for spring or fall. Heat a medium pot over medium-low heat. Add the olive oil and butter, letting the butter melt. Stir in the shallot; cook until translucent, 5 to 6 minutes. Add garlic and cook another minute more. Measure in the flour; stir, and cook for 1 minute. Whisk in the broth, 1 1/2 cups milk, cream cheese, salt and pepper; cook, continuing to whisk, until it begins to thicken but does not boil. Remove from heat, then add cheddar. Whisk until soup is smooth. If the base seems too thick, add a splash or two more milk. Add the spinach, then let sit for 5 minutes before serving, just until the spinach has wilted. Serve soup topped with croutons or a few extra sprinkles of cheese, if desired. Recipe updated/published for The San Jose Mercury News. Aaaah, it’s been many a year since I’ve been at the Landmark and I have been craving the spinach bisque there since. Come up with a recipe that’s similar to Cherry Street’s Mud and I will swoon. Swoon and promptly put on 20 pounds. You know, I think the recipe for mud is easier than most people think! Galesburg actually has some classic dishes- I have a crepe post coming soon! I worked at the Landmark for years as a cook, and when I’m in Galesburg I always stop in to see Phil and have the bisque. I had to smile when I read the into to your recipe. Although I can’t betray Phil by posting the recipe, I will say that Landmark bisque has both”velveeta” AND half and half. it also has cheddar, parm, chicken base (I prefer”better than boullion”) and frozen spinach. No onion, no cornstarch, and no olive oil. Your french version was more accurate than you think. The above recipe looks delicious, but the thickness of Landmark’s bisque comes from lots and lots of yummy fatty cheese! Mmmmm, they also have the best cup of coffee in town, and I can’t resist their turtle crepe. Yum! Thank you! I worked at the Macomb Dining Co back in the early 80s. It was started by the same people who owned the Landmark and it seems as though every year during Lent I wish I had this recipe. Can’t wait to try it. Living in Galesburg myself, I love Landmark’s Spinach bisque and have tried a couple different recipes for it. Recently, someone told me to use cream cheese instead of Velveeta. I found your recipe, which states “4 cups of cheese your choice” and substituted Weight watchers onion and chive cream cheese. I took it to a work potluck where many people are on diets, and the response was tremendous! I also used fat free half and half. I did wimp out and use frozen spinach instead of raw, but otherwise followed your recipe. The other comment was on how thick the bisque was – I only used 3 cups of chicken broth and let the bisque simmer overnight in a crock pot. This is a keeper! Thank you! Hi, my boyfriend asked me to make a soup for his work mates and the first thing I thought about is spinich bisque. I was born and live in Australia, but my mum is from Galesburg and I was literally mid sentence about how good the Landmark’s bisque is when up popped this site. Thanks for the recipie hope I can do it justice. I can’t believe I found your recipe and advices from Frosting Lover …. I was an exchange student in Galesburg back in 94 … and fell in love with the spinach bisque from Landmark … I tried to get the recipe to go home but fail to convince the owner:-) It’s been so long I am dreaming about eating it again such a delicious soup! I can’t wait to try out your recipe … the challenge is gonna be to find the velveeta cheese over in Belgium. Made this last night and it was delicious! I used vegetable broth instead of chicken broth and it turned out tasty. Thank you for another great recipe. I lived in Galesburg for a short while, and years later I still miss the Landmark’s Spinach Bisque. I’m so glad to have found your recipe! Used to live in Galesburg and I crave the Landmark’s Spinach Bisque. Now when I visit family the I love to stop by and eat. Oh my gosh!! 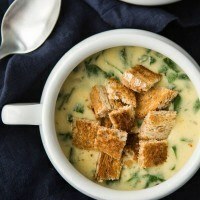 I was looking for a recipe similar to the spinach bisque I ate at the Landmark when I used to go to Knox College in Galesburg so many years ago! I couldn’t believe it when I saw “Landmark”, “Galesburg”, and “spinach bisque” in the description! I am so excited to try this; thank you, thank you, thank you! If you can come up with the Packing House’s cinnamon rolls, you’d have everything wonderful about Seminary Street! I think I actually know the secret behind those and did a riff on them for my upcoming cookbook- so good! Yum, thanks so much for revisiting an old favorite for us. Wonder if I could get my kids to eat this :). I love soup. There’s nothing better on a cool day. This looks amazing. I made this for myself for dinner last night (My husband and son say they don’t like cooked spinach). I’m so glad they didn’t want any because now I can eat it all myself. So delicious, and so simple to make. This will be in my bowl often. Thanks so much! I made this last night for dinner … absolutely delicious and so easy to make! Thank you for a great recipe. I will definitely make this again. I live to block from the landmark yet here I stand making spinach bisque. I took your recipe, used half and half, threw in some Velveeta and parmesan and it is amazing how close it comes to the landmark. Thanks for posting this! I live in Austin now but I am from Galesburg and miss the Landmark! O.M.G. I just got back from Galesburg. I had the spinach bisque Saturday night after the excellent concert by the Knox-Galesburg Symphony, and I can’t stop thinking about it! I dreamed about it last night! So to be able to go online and find a recipe for it is sheer heaven! I can’t wait to go back to Galesburg and try some more of the excellent food at the Landmark. Next up will be the Turtle crepe. A friend had it, and it looked DELICIOUS! Thank you for posting this recipe and the comments!